welcome to the Catherine Pooler All That Jazz Release Blog Hop! Today we are celebrating all the fun new goodies that are coming March 20th to the Catherine Pooler Shop - the All That Jazz Release and the Counting Blessings Stamp of Approval items will be available individually. From the new release, I used the Black Tie Gala Paper Pack and Wonderful die combined with a stamp from the last release, Love Grows. 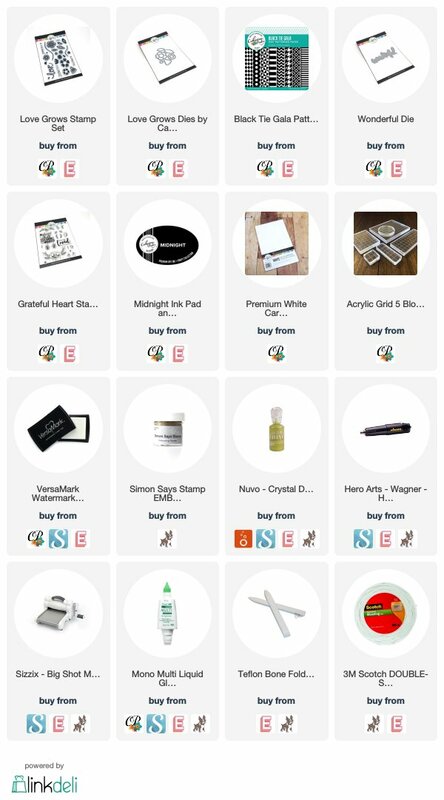 I love showing off how you can combine your previously purchased products with new stuff! Prize! Win 2 Catherine Pooler Ink Pads by leaving comments on the blogs! 5 Winners will be chosen March 23rd! I had originally created this card when I was making up samples. I loved the way it turned out so I had to make a video on how to make it! It really is quite simple. For the video, I did used the thinner striped paper from the Black Tie Gala Patterned Paper Pack to show off how you can make the same card look completely different, just by switching the design on the black and white patterned paper. I love how the wonderful die is so thick! It took three layers of gold embossing powder to achieve this look. It almost looks like a chipboard embellishment! Here you can see the card using thinner striped paper. I did design the card to be very similar (give or take a couple flowers). I love all the gold embellishments and hints of gold stems underneath the flowers! The flowers are from the Love Grows Stamp Set! Click here to shop the new release March 20th! Please note the supply list will be updated with additional products when the products are released March 20th. So pretty. Thank you for sharing ideas and tips and suggestions to help us to continue to create. 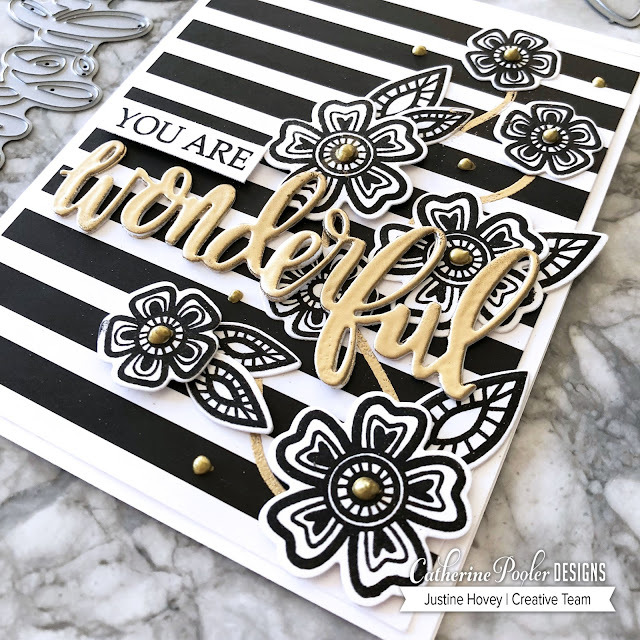 Stunning cards, love the black and white with gold and awesome Wonderful die! Thanks for sharing Justine! I love the black and white with gold accents! Beautiful! Justine, the Catherine Pooler stamp set Love Grows is so pretty. You really showed it off well. This is a great card. Love the stripes and the gold! The gold stems are inspired. The whole card is beautiful. So classic and sophisticated! Love the colors. Great cards, Justine. Really showcases the products. So elegant!! The touch of gold with the black and white really is nice. Great job! Love the black and white and gold color scheme on your cards! Beautiful! I love the black, white and gold! Love your card! Simple but perfect! Just love the way you made the card and the colors are great. Thanks for sharing and have a wonderful week. Very classy look in b&w! I really like the triple embossing technique and the colors! Such beautiful cards! I love the gold on the black and white, especially the bold striped one. I love the black and white mixture of florals and stripes. Over the moon in love with this back and white paper. Adding the flowers with All That Jazz ink made the card POP! Stunning card. Love the simplistic color palette. This card is beautiful. Love the triple embossing. really like the beautiful gold embossed sentiment - very lovely card! Justine, your card is awesome. Love how you used the paper and gold embossing really pops out with black and white. Wow! Thank you for sharing your ideas and techniques. Beautiful cards. The black, white & gold combo is so elegant. Love love love the gold on the black and white!! What beautiful cards, Justine!! The black, white, and gold combination is absolutely stunning! I found you on a blog hop and here we are again! Lol I like what you do. Quick and informative! These cards are beautiful. The gold embossing really makes the word pop! I am totally in love with your cards and your video! The black and gold is perfection. I love how this card is simple but classic! Beautiful cards Justine...always enjoy your videos. Love the black and white with a touch of gold.....pretty and elegant. Thanks for using older stamps too....keeps me using them versus forgetting about them. Awesome cards! Great cards. Love the black and gold! These are great card Justine, I love the gold embossing powder against the b/w. Awesome cards! wow that tr5iple embossing sure makes that sentiment stand out - gorgeous card. Stunning cards. The gold on the black and white is very classy. Love the blackand white combo. WOW!! Stunning cards!! I LOVE the color scheme you used!! Awesome cards, Justine. The black and white and gold are so elegant together. Thanks for sharing. These are stunning cards. Very bold and beautiful. I am LOVING all the ideas with the black and white patterned paper. So versatile. 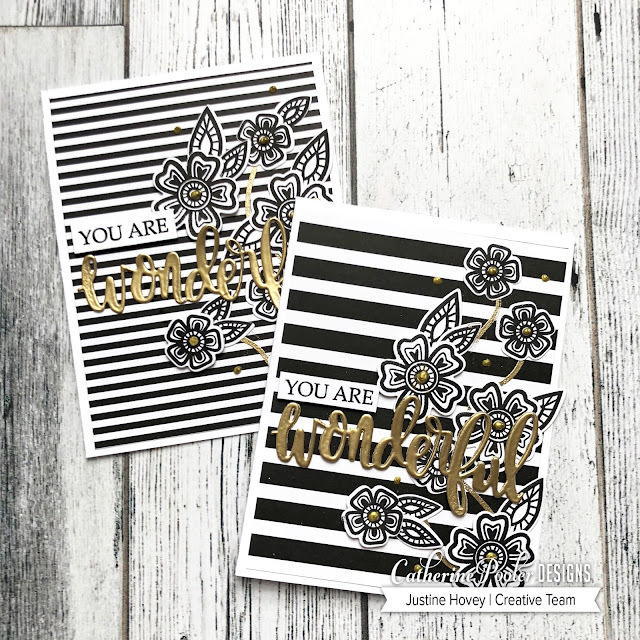 Your cards are elegant (black, white and gold) and whimsical at the same time (funky flowers and font). Always fun to watch you create, Justine. Black and white is stunning. Wow, this is beautiful Justine! I'm usually a fan of silver on certain crafts but I think that this gold looks amazing with the B&W!! I'm absolutely in awe over this card. Now I wanna go play in my craft room..but that's always a good thing, right? hehe This card just POPS with the B&W and gold, giving it a clean and elegant look. AMAZING! I’ll e the black and white. This card is so very elegant and I just love it. Art Deco style - black and white and gold. I'm sold! Black and white with the pop of gold is elegant; nice creativity. Lovin' the feel of both of your card beauties Justine! Love the touch of gold with the black white details! Gorgeous! Stunning cards. Love the black and white with the gold. Very pretty card! Will really make someone's day! Oohhhh the gold and black is so pretty together! The big gold word die really makes the black & white pop! Love this design! I love both of these cards. There’s just something so elegant about black, white and gold. Great job Justine. Those cards are awesome! I always love black and white with a pop of color. I adore the black & white foundation! The touches of gold really sets off your work! Another piece to pin as inspiration! I love that gold word. It just makes the card. Stunning cards! I love the classic look of black, white and gold paired with the lovely graphic florals. Very stylish cards. Love the combo of black, white & gold. Black & gold! It doesn't get anymore classy! Stunning card!! Love the black on white or white on black with a pop of gold! Those flowers and words dies are to die for! LOVE LOVE LOVE!! Black and white at it's best - with the gold addition just makes it perfect! Once again Justine, thank you for your inspiration! Black, white and gold is a classy color combination! I get so much inspiration for all your videos. 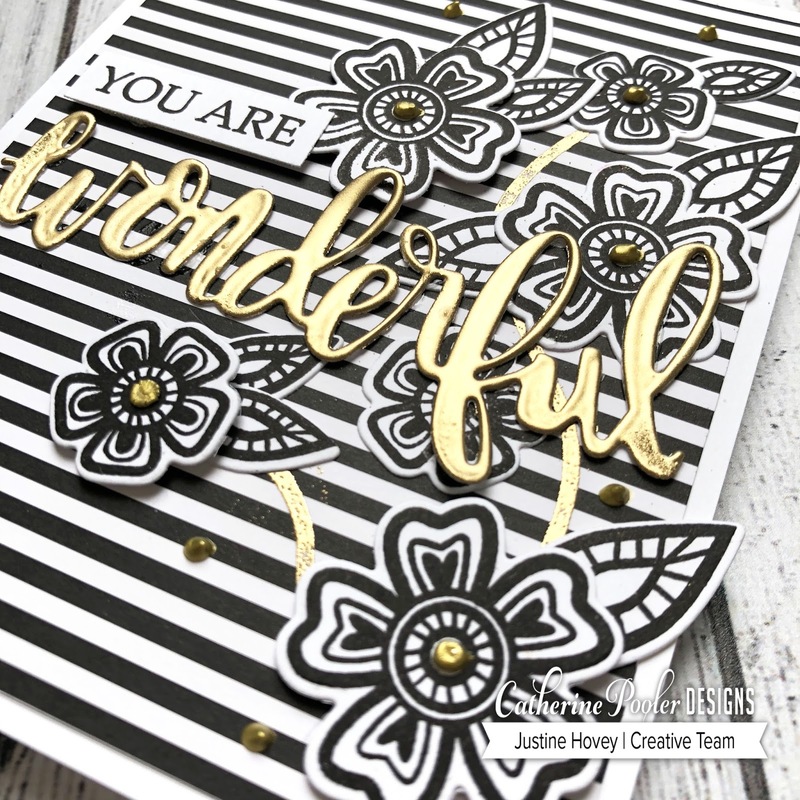 Love the way you've used the black striped paper, and that Wonderful die- SWOON! Love the use of the gold on these. OMG such beautiful card creations! Elegant cards! I'm quickly becoming a fan of black, white and gold! Love the elegance of the cards. You can never go wrong with black, white, and gold combination! Both cards are stunning Justine! Each one is very elegant and I love the gold stems you created for the flowers. Very classy with the black and white and the touch of gold. Great card! I like the black and white combined with the gold. Beautiful cards! I do love the look of multiple layers of embossing powder. Stunning and striking with the use of the black and white color scheme and the gold just really pops it! Beautiful! Your black and white creations are perfect, especially with that touch of gold. Thanks Justine. They're lovely, and I'll use that triple embossing idea for sure. Wonderful card! I love the gold sentiment! Lovely! You can't go wrong with stripes and the black and gold is very striking. Black, white and gold--classic and classy! These floral elements are perfect for this design. Thank you for another cool idea I can try! What beautiful cards! The black and gold are so classy and elegant. Great cards Justine! I especially love the one with wider stripes. It's so eye pleasing! Thank you for sharing your designs. Oh my ! Your color combo is so beautiful and classy ! Love the elegant look of these cards. The black, white and gold are perfect together! Thanks for sharing your creativity! Wow! Triple embossing, I've only ever double embossed before but I am definitely going to have to try this! There is something so classy about white and black and a bit of gold! Thanks for sharing. . .
Justine your card is very striking. Love it! Your cards are so lovely. You really can't go wrong with black, white, and gold, but yours have a little extra fun to them. I particularly like the use of the gold Nuvo drops in the middle of the flowers and around the card; that really makes the whole card cohesive. Thanks for sharing! Love that black & white paper! You make triple embossing look easy. I have done it once and mine wasn’t as smooth. Guess I need more practice. I absolutely LOVE the black and white with the gold words. Just gorgeous! So elegant! The thinner stripes are a little eye-bugging, IMO. Terrific combo of the gold and black and white! Loved your video too. Stunning cards. Thanks for sharing. I love the black, white and gold combo. So pretty. Those flowers are awesome! Black, white and gold? Yes please!!! More black and white elegant cards. Wonderful! Really stunning. It's wonderful to see how cool the black and white (with gold) can be! I like the simple look of gold with black and white. These flowers can be used repeatedly in various presentations, from a garden look, to a bouquet, or a string of flowers. When you can use the same materials to get very different looks, it makes it easier to invest. So strong a combination - very elegant! Gorgeous monochromatic card, so classy and elegant with the touch of gold ! Beautiful showcase. Thanks for sharing. Gorgeous cards!! Love the black, white, and gold combination. So classy!! And I am a fan of the multiple heat embossed layers. I always do 3-4 layers on a sentiment die cut like this. It's just stunning in the gold! These are so very elegant with the color combo. Cute card! I have lot of striped paper and now have some great ideas! Such a simple color scheme - and so impressive! Loved the card! That splash of gold finishes the cards - love it. the black and white cards are stunning!! Great combo of black, white and gold. Very elegant.